Input One or several FASTA sequences up to 20,000 nucleotides in total. File uploading allowed. Output Rich interactive web page containing detailed information about candidate oligos, on-targets and off-targets. Scores, coordinates and overlapping genes are shown. Mini genome browsers allow checking the genomic environment of each putative off-target. Results can be downloaded as tables. Throughput Medium/High. Multiple queries in batch are allowed. Use cases To design sgRNAs and evaluate putative undesired off-targets for CRISPR/Cas applications. 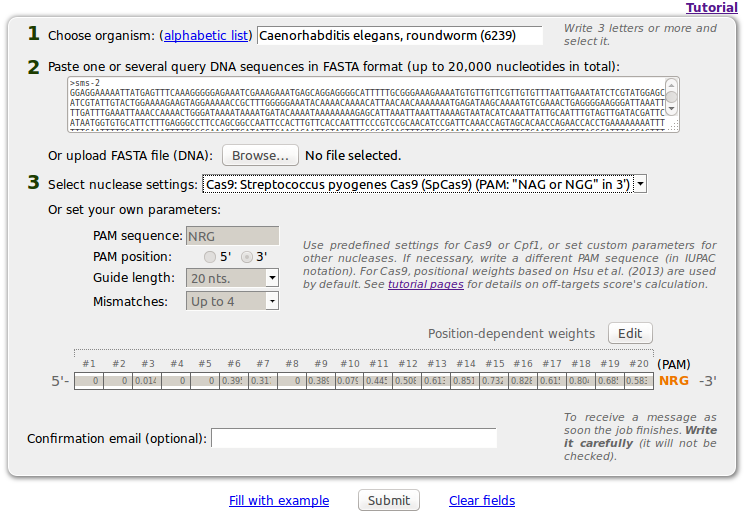 It can be used for any eukaryotic genome available at ENSEMBL/ENSEMBLGENOMES. Genomes More than 650 (as of April, 2016). sgRNA constrains Versatile system: oligo size, mismatch number, PAM sequence and position, and scoring system can be customized by the user. Pros Very fast and easy to use. Results are interactive, very detailed and well organized. Cons Does not include any method to measure sgRNA efficiency. Table 1. Breaking-Cas's features. See Table 2 of Graham and Root, 2015 for a recent comparison of the very same fields for other similar tools. 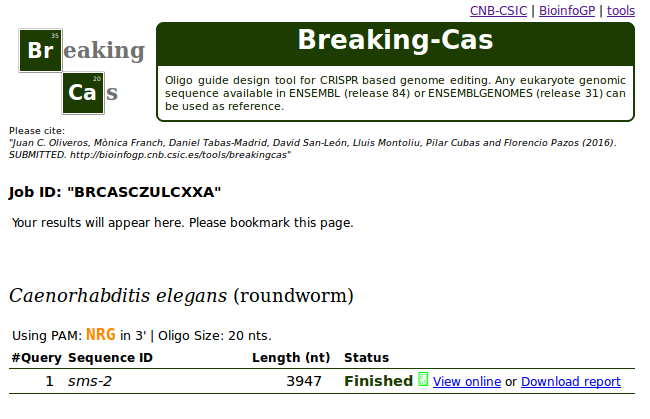 This guide illustrates the use of Breaking-Cas with the analysis of the sms-2 gene from Caenorhabditis elegans (roundworm). Following steps 1 to 3 is equivalent to using the "Fill with example" link at the bottom of Breaking-Cas form. Step 1. At the input form, select Caenorhabditis elegans as organism (write the name or select it from the alphabetic list). (Alternatively, upload a text file containing the same sequence). Positional weights are editable to take into account position-dependent relevance of mismatches in the oligo when calculating off-target scores (see Box 1 below). A value of "0" means that the mismatch is 100% allowed by the nuclease whereas a value of "1" means that any off-target with a mismatch in this position will not be recognized by the nuclease (Soff=0). Weights have been obtained experimentally by evaluating the nuclease activity in an array of oligos covering a large space of the sequence positilities (e.g. those obtained by Hsu et al (2013) for Cas9, included in this server in the presets for that nuclease). Changing these values (as well as the other parameters of the nuclease) allows to use this server with generic experimental datasets on nuclease preferences (e.g. unpublished) provided they are compatible with Hsu's formulation. Nevertheless, this is an advanced feature and should be used only by experienced users. Wrong weights can lead to misleading off-target scores. Inexperienced users are advised to leave the default values offered by the server. Finally, introduce your email to receive a message when the analysis is finished (optional). and click Submit button. If all input fields are correct, a "waiting room" page will open and the analysis will initiate. Depending on the size of input sequences and genome, the process will take from a few seconds to several hours. When the analysis is finished, the results can be opened on a new window (available on-line for a few days) or downloaded as a compressed folder (recommended). In this last case, uncompress this file and open "index.html" with any current web browser to see the interactive results page. Oligo candidate details and their genomic targets are presented as an interactive web page divided in three main parts: Upper Section, Left Panel and Right Panel. Input sequence ID, Organism name, and parameters used are indicated. This table shows all oligo candidates found for the input sequence (e.g. 20 nt followed by a compatible PAM (NRG) in the case of Cas9). By default results sorted by the aggregated score. Thanks to the explicit PAM sequence provided, users can limit their gRNA candidates to those with a desired PAM while allowing a more generic PAM for off-targets. The typical case is S. pyogenes's Cas9, where NGG is desirable for gRNAs, whereas off-targets can contain NAG or NGG (NRG in IUPAC). Use the text-boxes right above the column headers to apply numerical filters to any column (example: for showing only oligos with score > 99, write ">99" in the SCORE textbox and click Enter). Click on any header to sort values (click again for reverse sorting). Click on any row to select a candidate and show its targets details at RIGHT PANEL. Trails of four consecutive Ts are highlighted in red since they can lead to problems in CRISPR/Cas setups involving pol-III, due to the similarity with the termination motif of this polimerase. START Start position of the oligo in the input sequence. END End position of the oligo in the input sequence. STRAND Strand (+ or -) of the input sequence were the oligo was found. OLIGO Nucleotide sequence of the oligo candidate. PAM is also indicated. ONTARGETS Number of alignments with zero mistmatches in the reference genome. OFFTARGETS Number of alignments with one or more mistmatches in the reference genome. GENES Number of overlapping or nearby genes. Both on-targets and off-targets are considered. 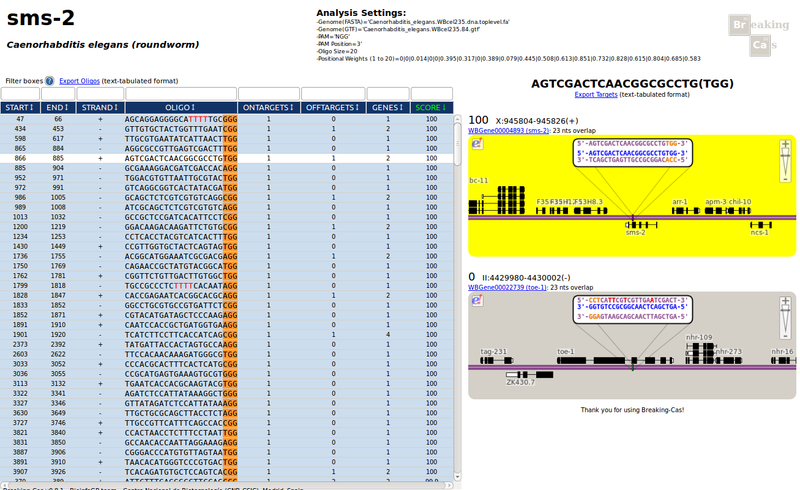 When an oligo is clicked on the left panel, target details will appear in the form of minibrowsers illustrating the hybridization sites in the genome. 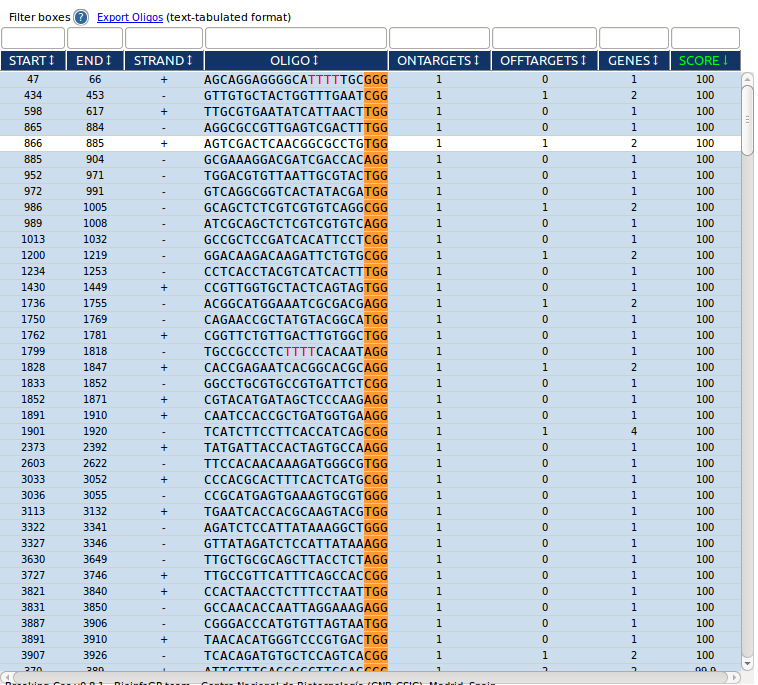 Above each minibrowser, the Score (Soff), chromosome, coordinates, strand and overlapping genes (linked to ENSEMBL pages) are indicated for each genomic hit. See BOX 1 for details on score calculations. Minibrowsers in yellow correspond to ON-TARGETS (perfect alignments). Minibrowsers in grey correspond to potential OFF-TARGETS (alignments with mismatches). For a quick interpretation of alignments, the two DNA strands and the oligo are displayed. Use the zooming tool on the right to increase/reduce the flanking area. Click the e! (ENSEMBL logo) to open the region in the original ENSEMBL genome browser which shows more features and provides links to additional information associated to the genomic region. TIP: double-click at any minibrowser region to expand/collapse genes (useful to view splicing variants). 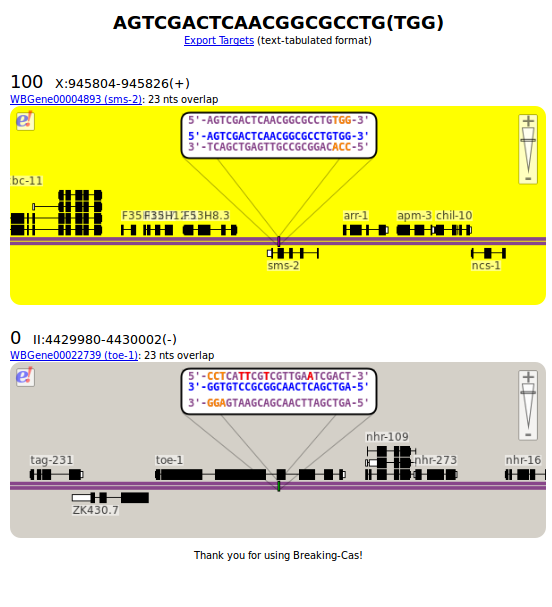 A comparison between Breaking-Cas and CRISPR Design Tool (MIT) is available here (pdf). Results are very similar yet not identical, probably due to small differences in estimation of pairwise distance between mismatches for each off-target. Not only the number and characteristics of potential off-targets should be taken into account when designing sgRNA, but also its on-target efficiency. Thus, it is advisable to use Breaking-Cas in conjunction with a tool aimed at predicting on-target efficiency, since the final goal is to find sgRNAs with high on-target efficiency and a low number of off-targets. sgRNA Scorer 1.0 (Chari et al, 2015) is an interactive web tool that can be used to assign a predicted activity to sgRNAs selected by Breaking-Cas (or other similar tools). The predicted activity is based on support vector machine models from experimental results obtained with Cas9 from S. pyogenes or S. thermophilus in human 293T cells, so its application is restricted to CRISPR/Cas9 experiments. sgRNA Designer (Doench et al, 2014) is another interactive tool that provides ranked lists of sgRNAs and their predicted efficiency, which can be used in combination with Breaking-Cas results (restricted to S. pyogenes Cas9 nuclease). In this case, the predictor is based on the analysis of the ability of a pool of 1,814 sgRNAs, covering all possible target sites of a panel of several human and mouse genes, to produce null alleles of the target gene. WU-CRISPR (Wong et al, 2015) uses the same experimental data than sgRNA Designer predictor. The authors compared the most potent sgRNAs (top 20% in ranking) with the least potent sgRNAs (bottom 20%) and found sequence features (different from those used for sgRNA Designer) related to sgRNA efficiency. These new sequence characteristics were incorporated into an algorithm available in form of web tool or stand-alone package. SSC (Xu et al, 2015) is a web page where the user can search a DNA sequence for sgRNAs compatible with CRISPR/Cas9. This tool predicts the efficiency of each sgRNA based on sequence features extracted from the analysis of the outcome of several published CRISPR/Cas9 experiments. The method can consider different features for CRISPR knockout (native Cas9) and CRISPR inihibition/activation experiments (dCas9). M = positions with mismatches. W = Effect of each mismatch position (see Table 2) (from Hsu et al., Nature Biotechnology 2013). m = total number of mismatches. The above formula takes into account the influence of the mismatches due to their position (T1), the effect of the mean pairwise distance between mismatches (T2) and penalizes targets with many mismatches (T3). If there are no experimental evidence for the positional influence of mismatches, for each off-target, the probability of being a true secondary target is estimated as above except that all positional weights are set to "0" so the factor of the equation that depends on the mismatch's positions (T1) is always 1. Also, in the general case, the "19" in T2 term of the formula is replaced by oligosize-1. It is possible to introduce customized positional weights (values between 0 and 1, being "0" a totally allowed mismatch and "1" a totally forbiden mismatch) for nucleases with experimental evidences known by the user... modify them at your own risk. This Sguide can be used as a main criteria to select interesting gRNA candidates: the higher the aggregate score for a gRNA candidate, the less "problematic" the off-targets will be. Oligo alignments with no mismatches (on-targets) are not included in the above formulas and have an imputed score (Soff) of 100.